Superior EMI/RFI performance is achieved by the use of a metal case, in conjunction with surge and ESD suppression components and RFI filtering on the inputs and outputs. The Model 760 has an integrated sliding cover that provides easy access to multi-turn potentiometers for fine zero and span adjustments. Inconel is used for all wetted materials allowing the Model 760 to be used with corrosive gases. A wide range of pressure and vacuum fittings are available. 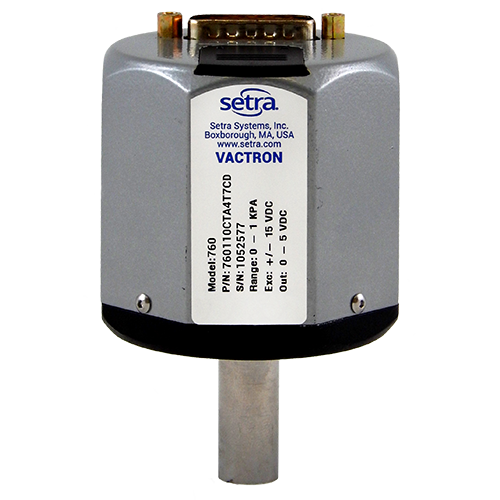 The high accuracy pressure sensing element used in the Model 760 is the VactronTM sensor, which has been developed from Setra’s variable capacitance sensor. A centrally located feed-through assembly supports a circular electrode in close proximity to the back surface of the diaphragm. Together the electrode and diaphragm form a variable capacitor within a small reference vacuum chamber maintained at very low pressure. As the pressure increases, the diaphragm deflects and the gap between the electrode and diaphragm decreases, causing an increase in the capacitance. This change in capacitance is detected and converted to a highly accurate linear DC electronic signal by Setra’s unique custom integrated circuit, which utilizes a patented charge balance principle.